Great LO Lisa - and I really enjoyed seeing how your sketch developed. 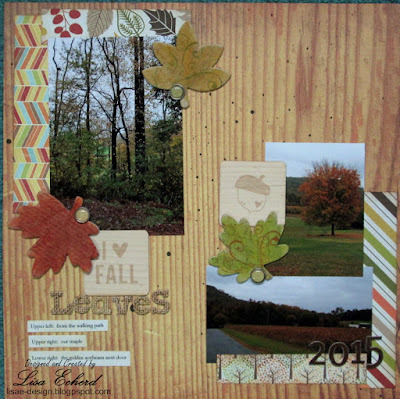 I liked how you embellished your chipboard leaves too. I love your designs. I'm interested on how you print more than 1 photo on a 4x6 sheet. Can you do a video on that like you did for printing project life cards? I've learned so much from you already and just started your stencil class. Yes, I really want to do a video on that. I did however upgrade Photoshop Elements recently and am still getting my steps down. To me it is a bit clunkier but that may be learning curve. As soon as I'm comfortable, I'll do a video on printing multiple photos on a 4x6. Thanks!